Patented Mitchell fitting Bazooka Base which incorporates massive strength, a stable build platform, fast construction and ultra-versatility into its modular design. Fixed or Adjustable Riser options. Castor & Track Skate Wheels available. Massive strength, stable build platform, fast construction, ultra-versatile, modular design, no cost constraint design. The main design points we set ourselves when we started work on a new system three years ago. Since then, a couple of sets prototypes, days and weeks of real world and simulated testing, we now have what we believe to be the best bazooka system available – anywhere. We have taken another look at how we join the elements of camera supports together. 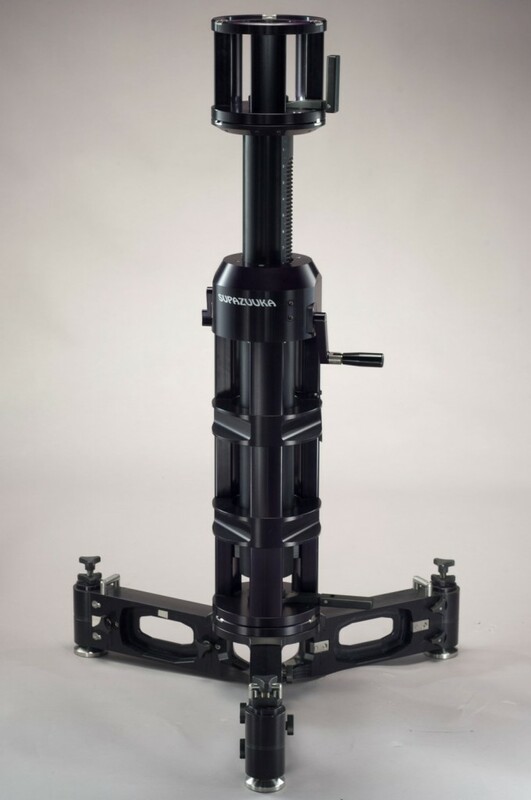 The EuroBoss, with it‘s 100 mm diameter mating face is just not strong enough, put together a boss-type bazooka column of more than 600 mm, add a large fluid head or gears and see how much flex you‘ve put up with. The 7“ Mitchell fitting is very strong, but too time consuming to assemble, how often has that nut been cursed by the grip? Who then needs to find a Tommy bar or seat riser to ‘hammer’ it tight. Our patented connection starts with a ‘true’ Mitchell top fitting, adds a quickly removable tri-point adaptor, and with it‘s opposite becomes a fast, familiar, very secure fitting. Put the two elements together, spin down the knurled nut – don‘t even go hand tight, and pull the lock-lever. that‘s it. The lock-lever then folds up out of the way. All of the parts in our new bazooka system, from base to leveler, use this connection method. Any camera support can only be as strong as its base – obvious really. So why continue to build from flimsy, Euro Boss type bases? Any of the levelling jacks can easily be replaced by scaffold tubes – securely held by the built-in clamps. Uses no tools to change its configuration. We believe our low-weight riser elements to be the strongest, most rigid available. A set of 5 elements of 100, 150, 200, 400 and 800 mm in length give the widest range of size combinations for the minimum number of pieces. Three-leg design using a custom extrusion, CNC machined billet alloy components and high-tensile stainless steel provide massive strength, high torsional rigidity and no rust. The no-welding construction allows for easy repair. Strong, rigid, as light as possible – a common design theme. Our new wind-up risers are made in the same way as the rest of the system. CNC machined billet alloys, high tensile stainless steel, special metal treatments. No tools required to either fit or adjust. Optimised gearbox ratio allows easy height adjust under full load – without affecting the level. Available in two height ranges, 300 to 410 mm and 600 to 1000 mm. Our new 4-way combi leveller, designed with multiple base options including Bazooka, Mitchell and Euro fittings designed to level the camera as quick and intuitive as possible. A design that provides a firm, stable Mitchell fitting at angles up to 15 degrees all ways. Uses straight levels that are only affected by one adjuster. Gives side access to the Mitchell top fitting, with minimum overall height. By incorporating the ‘T’ Section with your Bazooka System you can convert the base into a dolly. There are 3 available bases, Euro, Mitchell and Bazooka Style, all fit into a Peli 1610 case.